If a sommelier suggests a wine that offers heft and swagger, don’t be surprised if it turns out to be pinot grigio. A style of the grape called ramato delights adventurous palates. Pinot grigio, related to France’s pinot gris, is usually made into white wine. But when these pinkish-skinned grapes are crushed, and the juice spends extended time on the skins, coppery hues result, as well as teasing texture. In Italy, these salmony quaffs are known as ramato. Bottles made in places like Slovenia don’t use that term, but the style is apparent in the color and texture. One of the bottles on Fairsted’s list that falls into this category is a 2013 Pullus Pinot Grigio made by the oldest winery in Slovenia. While the Italian term “ramato” does not appear on the label, its rose-gold tones clue you in. Aromas call to mind a bowl of stone fruit, citrus, pear, and even a hint of something tropical. But the palate is assertively tart, robustly mineral, and threaded through with a fine-grained texture that you can feel after the flavor finishes. This is not the pinot grigio you’re expecting. Peter Nelson, beverage director at Puritan & Company in Cambridge, describes similar guest reactions. 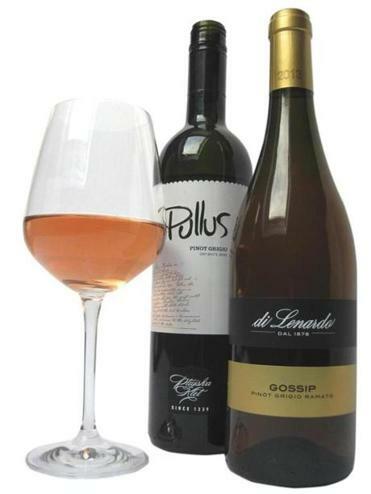 “People often order pinot grigio because they think it is neutral — a nice white wine, not oaky and not sweet.” So there is inevitable surprise when Nelson and his crew pour a 2013 Di Lenardo “Gossip” Pinot Grigio Ramato. From Friuli in northern Italy, this bottle offers a slightly softer expression of acid than the Slovenian pour, but conveys unmistakable texture from the first sip. “The flavor suggests a pinot grigio, but in a blind tasting, people wouldn’t identify it as that,” Nelson says. Both sommeliers love encouraging customers to try this coppery style. “We help guests find their inner adventurer,” says Nelson. The 2013 Pullus Pinot Grigio is $36 a bottle on the wine list at Fairsted Kitchen, 617-396-8752; it retails for $18 at Gypsy Kitchen, Quincy, 617-847-1846, and Vinodivino, Newton, 617-527-8466. Di Lenardo “Gossip” Pinot Grigio Ramato is $40 a bottle and $10 a glass on the wine list at Puritan & Company, 617-615-6195; it retails for $15 at The Wine Emporium, Boston, 617-536-5545, and Red, White & Brew Market, Acton, 978-429-8360.